The year we were married, my husband and I started sharing our home with two dogs, Simon and Smudge. They were brother and sister, but looked nothing alike. 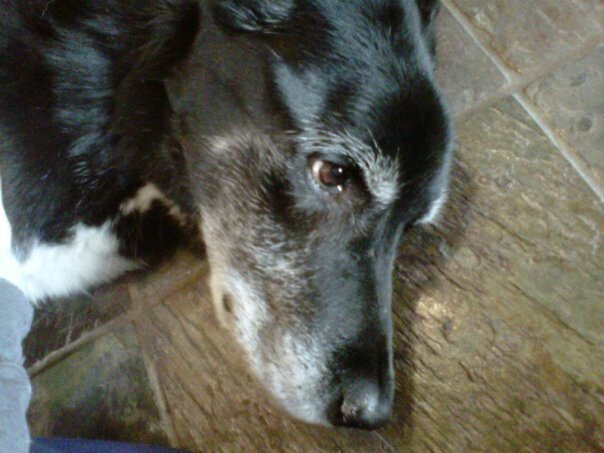 Simon was what we called the “Montana Black Dog”–a black lab mix with a white beard, white tipped tail, and white feet. 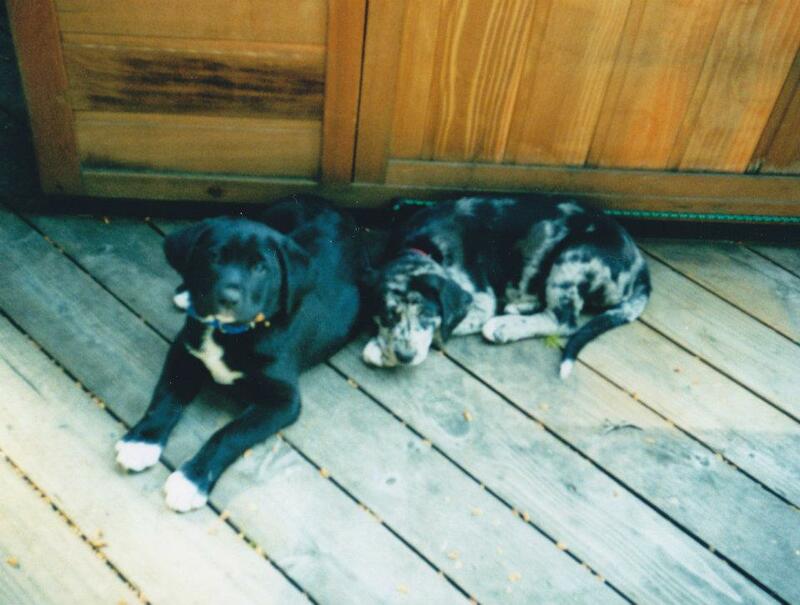 Smudge was also part black lab, but looked like her father who was a Catahoula Leopard Dog. A what? Exactly. The state dog of Louisiana, apparently. Our friend always called her a Saskahootchie Marmot Hound, so we did too. 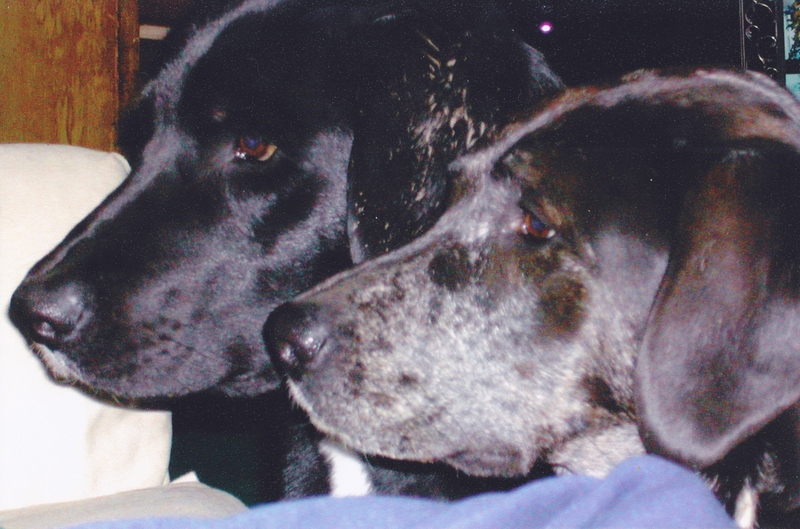 Anyway–to get back to the story, Simon and Smudge were generally great dogs, even though after the age of three, Smudge could not tolerate being around any other dogs except Simon and her mother Osa. They never really had much interest in the boys, though–Smudge always looked confused as to why they were still in her house day after day. 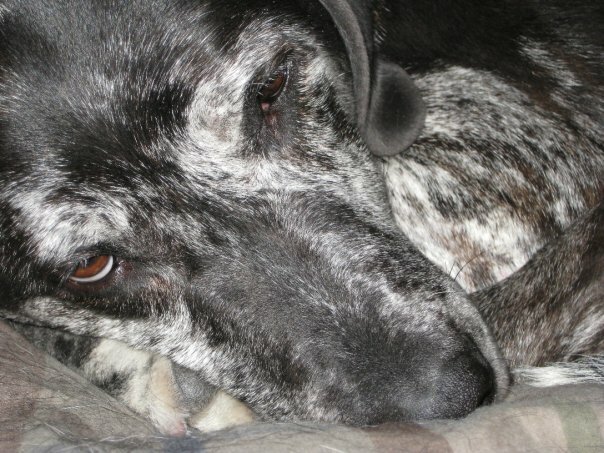 She died a few years ago at the age of 11, suddenly, from a cancerous tumor bursting in her abdomen; it was, of course, very sad. Her brother Simon received something of a new lease on life, though. Finally he could go out in public again, to places where we hadn’t been able to take Smudgie. 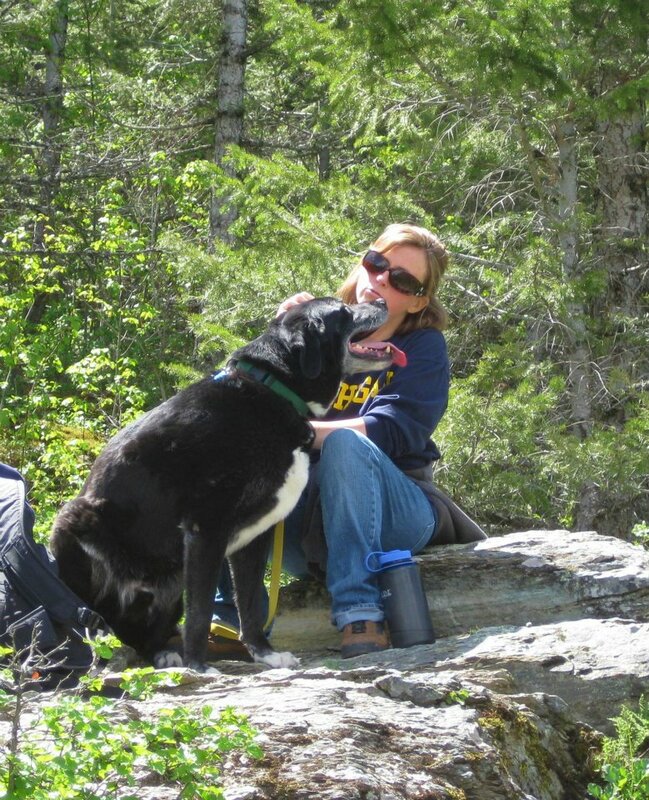 He hung out with us in the front yard, went on road trips, went to River’s Edge Park–it was great. Then last year, when it became clear that he was losing weight, Simon was diagnosed with cancer of the liver. We babied him in his last months, but when it became obvious that he was miserable, we made the decision to release him from his pain. It wasn’t an easy decision–why should we get to determine his last day alive? Still–it was the right one. When he was given his sedative, it was the first time in months that he seemed comfortable. Still chokes me up to think about it. I’m sure, selfishly, we kept him around longer than he wanted to be here. The house was so empty. And clean. And empty. I had long said that our next dog would be medium sized, with a light colored fur. Our next dog wouldn’t drool or get nose prints all over the picture windows. We ended up with…a Newfoundland. If you know anything about Newfies, you know they are gigantic, usually dark furred, slobbery drool-y messes. 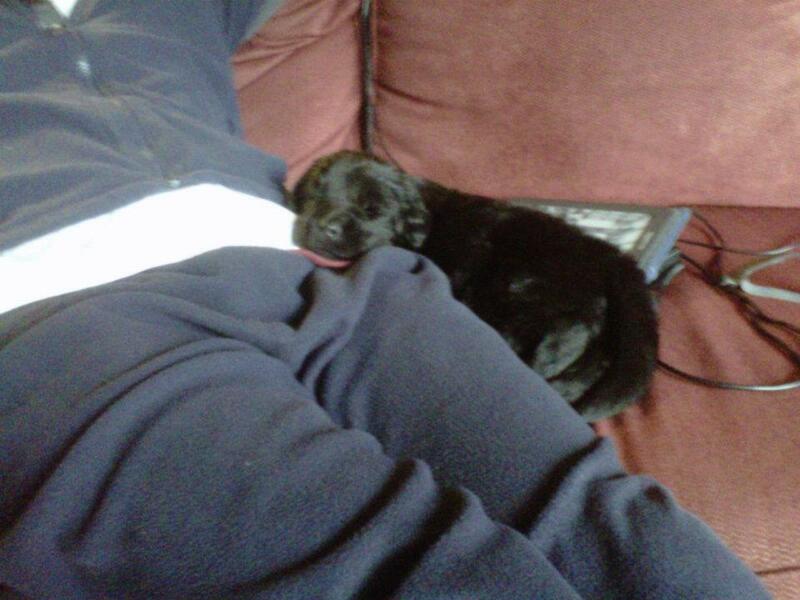 When we picked Murphy up, she could rest on one of my fore-arms. Now, at eight months, she is a full head taller than me when I am sitting on the ground next to her. Having a Newfoundland is an experience. She is still a puppy, and acts like it, but she is a nearly 90 pound puppy. We took her to obedience classes, and she knows her commands, but looks at us like we are idiots if we expect her to do anything without treats in our hands. My picture windows look like they have been finger-painted. She regularly wipes her drool all over everyone’s arms and laps. She mumbles when she gets in trouble, like a teenager talking under his breath when being sent to his room. We can (mostly) get her to lie down when we are eating dinner, but she stomps her paw when we haven’t paid enough attention to her. She walks well, as long as she is wearing her fancy pink Gentle Leader (that little device saved us!) and she knows how to ring a bell to go outside. We have a few items to work on, though. She still jumps, is still mouthy, and pounds on our picture windows when she wants to come inside. And she barks–she takes to the perimeter of our fenced yard and barks at anything and everything. We don’t keep her outside–that is where she prefers to be. She will come in for a while to play, but invariably she rings the bell to go outside to hang out on her Coolaroo elevated bed. We adore her. I’m not convinced that she will become the giant, mellow gentle beast she is purported to be, but I suppose it could happen. We love her anyway. Does anyone else have Newfie experience? 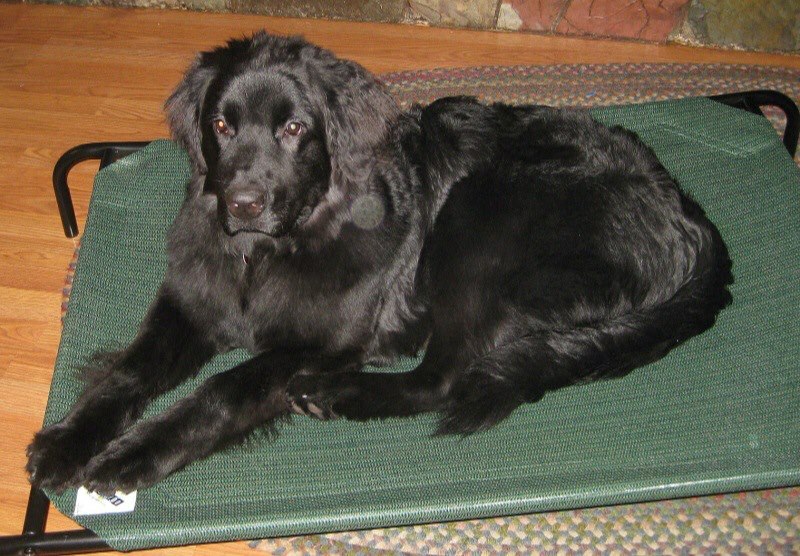 Did you have a crazy Newf who eventually settled down? Any tips from Newfie veterans? 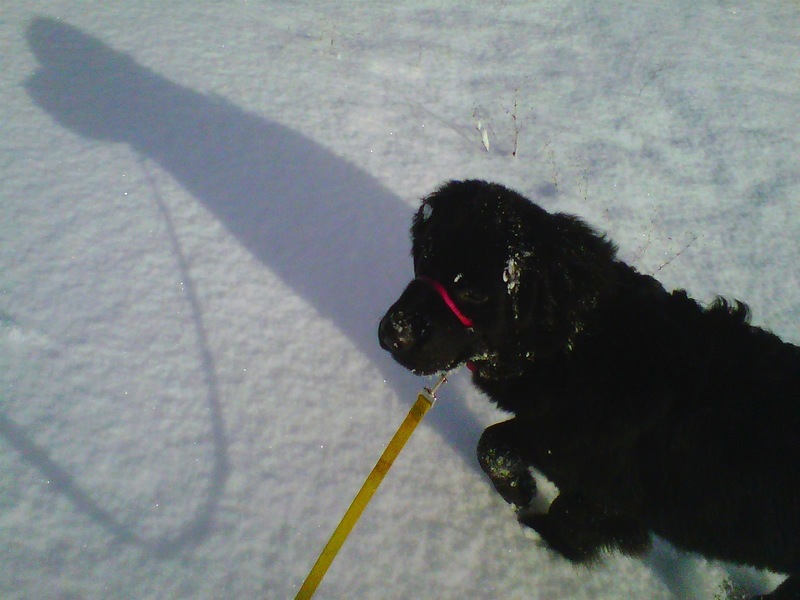 This entry was posted in The Newfoundland and tagged bell training, Black labs, Catahoula Leopard Dog, Coolaroo, dog cancer, dogs, Gentle Leader, Newfies, Newfoundlands, puppies. Bookmark the permalink. ← Oh My Goodness. The Palette Cafe. I have a delightful Newfie and a crazy 16 week old pup, Nikki. We are full of adventures right now with three dogs, two cats and four horses. And oh yes, teaching and volunteering! I am a newfie lover, parent, grandparent & rescuer. My first girl Abby was a pistol but settled down by the age of 2. Pretty sure it was parenthood. My boy Oliver – Registered name “Mischief Maker” (guess how he got that name) was a major thief well into his 2nd yr. – the dreaded tweens – but now & since age 3ish is an incredibly mellow lump of black fur. My old girl (rescue) has always been sweet & the new baby (17 mo.) has me running around like crazy. As a breeder, it is incredibly important for the pups to get educated by mom & dad. Yes dad. Oliver was a very involved parent from day 3 (first litter of 12) & comforted Abby during labor (10 pups) a year later & rarely left her side. This was 2009 & 2010. He did most of the discipline & teaching after weening. An amazing thing to watch. Quite normal for Newfies.Be patient – she will mellow out. If she is naughty try to find a positive direction. The stealing led to helping with recycle, laundry, mail, toy pick-up & even going after the stuff the baby has taken outside. We love her to pieces. I think that she will settle down as she gets older. Remember, the breeder gave her to us way too early. Had I known better, I would never have accepted her at that age.